An Aspen development firm says it will provide 1 acre of prime downtown land to the town of Basalt for a park in return for approval of an 85,000-square-foot condominium hotel and associated commercial development. Lowe Enterprises also will reimburse the town $1.2 million for expenses relocating residents of the former Pan and Fork Mobile Home Park, according to president Jim DeFrancia. Lowe reworked its plan for a portion of the Pan and Fork site after its initial concept got a chilly reception from the Town Council earlier this summer. An “amended pre-application submission” was turned in to the town government Tuesday. DeFrancia said he hopes to meet with the council members soon to take their temperature on his idea. Lowe Enterprises has an option to purchase 2.3 acres of the former Pan and Fork site from the Roaring Fork Community Development Corp. The property is adjacent to Two Rivers Road, east of the Rocky Mountain Institute building. 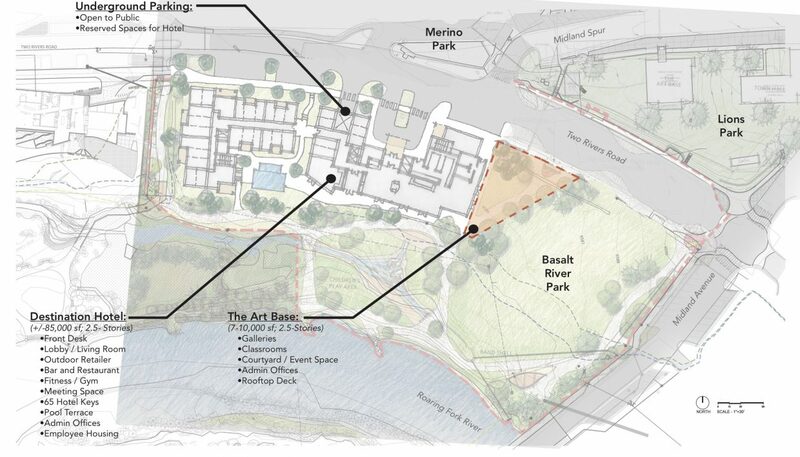 The town is developing adjacent property along the Roaring Fork River into a park. A controversy has raged for years over how much of the Community Development Corp. property should be developed and how much should be added to the river park. Lowe’s application adds substantially to the park while securing approval for enough development to make the project worthwhile for the development firm. “A reasonable level of development must be permitted to make any of this work,” DeFrancia said. ­An 81,000-square-foot condominium hotel that would provide 65 hotel keys through a combination of studio to two-bedroom units. The building would include three or four affordable-housing units. 4,000 square feet of commercial development for a restaurant-bar and some retail space. Conveyance of the 1 acre closest to the intersection of Two Rivers Road and Midland Avenue to the town government for $10 for use as a park. DeFrancia clarified that Lowe needs closer to $400,000 for the property. He wants any money provided by Pitkin County Open Space and Trails or Great Outdoors Colorado to be paid for the property. Lowe will reimburse the town government $1.2 million for expenses related to relocating residents of the mobile home park and removing their trailers. That’s about half of what the town claims it is owed by Roaring Fork Community Development Corp. The town would provide funding for an underground parking structure through what’s known as tax increment financing. The town would borrow against future revenue from a dedicated tax applied to the hotel, restaurant-bar and retail space at the Pan and Fork. No other property in the town would be assessed that special fee. There would be public parking as well as spaces for the condo-hotel. The town would be encouraged to provide space within the acre it receives to find room for the Art Base, a community arts facility. Lowe suggested the Art Base be given 7,000 to 10,000 square feet of space adjacent to the hotel property. Basalt Town Manager Ryan Mahoney said Lowe’s desire to hold informal sessions with the council before submitting a land-use application is unorthodox. “It’s a weird tap dance, in my mind,” said Mahoney, who joined the town in June and has a background in land-use planning. “It makes me a little uneasy,” Mahoney added, noting that the council could potentially hear the application as a quasi-judicial body, so it must be careful discussing the proposal prior to receiving an application. He said he would prefer seeing Lowe Enterprises submit a formal application that would be reviewed by the planning commission, then the council. Nevertheless, Mahoney said, it is possible the council would be willing to meet with DeFrancia a second time for an “informal Q&A” session. DeFrancia further clarified that if Lowe didn’t receive $400,000 for the 1 acre of land, it wouldn’t necessarily be a deal-breaker. As an alternative, Lowe could reduce the amount it pays the town in reimbursement, he said. As of Wednesday, no meeting was scheduled between DeFrancia and the council. DeFrancia said he is ready to meet whenever the council is willing. The council members showed during a retreat last week they remain divided over what they want to see on the Pan and Fork site.